Traditional media holding off digital challenge in the Chinese market. Yu Tianyu in Beijing reports. When Mark Twain read his own obituary in 1897, he wrote a letter to his friend assuring him "the report of my death has been exaggerated". The same could be said for China's traditional media, say analysts. In contrast to the sector's continued advertising slump in the West, research shows companies targeting Chinese consumers are sticking with television, newspapers and radio. For the time being, anyway. Total advertising expenditure in the first three quarters of 2010 rose 14 percent on last year to a record-breaking $64.5 billion, according to the latest data from market research firm CTR. Growth was seen across all three traditional sectors. The old guard are still attracting "international companies due to their enormous influence on local consumers" in big cities, said Yuan Shimin, a top freelance brand consultant based in Beijing. He explained that the country's "good economic situation and huge consumer spending potential" has largely fueled the boom. According to the CTR data, spending on television advertising hit $49.67 billion by the end of the third quarter, an increase of 12 percent on 2009. Newspaper and magazine advertising both saw a 19-percent rise, generating $8.56 billion and $1.65 billion respectively, while radio spots made $1.58 billion, up 33 percent. Statistics from the State Administration of Radio, Film and Television also show that television and radio stations had seen gains of more than 10 percent as of October, compared to the same period last year. The full recovery of the Chinese macro economy has "helped create a stable environment for growth in advertising" and robust consumption has "directly strengthened various industries' confidence", explained Barry Cupples, chief executive of Omnicom Media Group's Asia Pacific operations. Major events at home and abroad have also played a part. With the World Expo in Shanghai, Asian Games in Guangzhou and soccer's World Cup finals in South Africa all staged this year, an increasing number of companies have used them to "expand their presence, which has had a major influence of branding and marketing", added Yuan. 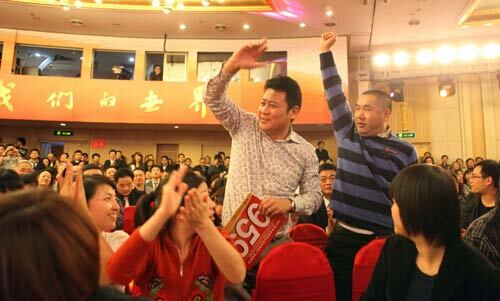 China Central Television (CCTV), the State broadcaster, held its 17th annual primetime slot auction in November, attracting winning of bids more than 12.67 billion yuan ($1.86 billion), a rise of 15.5 percent year-on-year. "The amount of money sets a new record in 17 years," said He Haiming, deputy director of the station's advertising and management center, who explained that food and beverage, home appliance and finance and insurance sectors "were the stars". In a recent report by the New York-based World Brand Lab, CCTV's brand value was put at more than 113.5 billion yuan, putting it fourth domestically behind China Mobile, State Grid and Commercial Bank of China. Money is rolling in for provincial stations, too. Hunan Satellite TV is expected to make 3.6 billion yuan from advertising this year, thanks largely to its adaptations of shows popular in Britain and the United States, such as American Idol and The Apprentice. Jiangsu TV, meanwhile, is aiming to generate 1.44 billion yuan in ad revenue, up 200 million on 2009. Following the success of dating show If You Are the One, the broadcaster increased prices by 30 percent. In the print media, one of the biggest winners has been Shenzhen Press Group, which owns ten newspapers, five journals and a website. The company posted an 8.2-percent year-on-year rise between January and October this year. An advertising department worker at 21st Century Business Herald, a best-selling financial newspaper owned by Nanfang Daily Media Group, also revealed his office had hit the annual revenue target of 300 million yuan by the end of October. Beijing News, which has a daily circulation of about 725,000, is also expected to see its advertising income grow by 32 percent year-on-year to 1.4 billion yuan, said president Dai Zigeng. He explained that most advertisers are in real estate, automobiles, education and tourism, as well as the finance and fashion sectors. "(Our clients are) usually (promoting) very high-value brands," added Dai. "The high quality and taste of Beijing News is basically dependent on its readership." According to the 2010 Rich List published by Hurun Report, which monitors China's wealthy, the nation's capital has the highest concentration of millionaires, including 94,000 people with assets worth 100 million yuan or more. "Whether someone is super rich or not, daily newspapers are still arriving on their breakfast tables or office desks every morning," said consultant Yuan Shimin. "That's the core value of these papers."